In the middle of Zanzibar are the spice farms, far from the bustle of coastal resorts and Stonetown, the island’s main commerce and tourist city. Departing Stonetown, we passed miles of roadside commerce tucked into open-air storefronts adjacent to the macadam road. Young and old alike walked from shop to shop picking up their daily necessities. Soon fields or forests hugged the road and were occasionally interspersed by a village. Each small community had several small retail shacks, surrounded by hovels and huts where people lived. Still there were people walking on the sides of the roads or waiting for the “daladala”–the open-air privately run bus system. Pods of children of all ages, laden with bookbags walked determinedly on the side of the road heading home after morning classes. About 30 minutes outside of Stonetown we turned onto a winding dirt road heading into the forest. Ten minutes later we arrived at Issa Spice. I was at the end of the road but knew I was also part of the economic lifeblood for this small rural community. Issa Spice is livelihood for the village and much of their money is made by tourists just like me wanting to learn how the exotic spices of the tropics are grown. Our dozen westerners walked through the equatorial landscape with our guide, in what felt more like a Zanzibarian jungle than a farm. Looking back, I know we were on a farm and not just in a forest, because every tree, shrub, grass or vine we walked by had a flavor to try. Zanzibar is a group of semi-autonomously governed islands in the east African country of Tanzania. It is home to almost one million predominately Muslim agrarian peoples. Its location about 20 miles off the east coast of Africa meant that historically it had been a major trading stop. As a result, the island has been influenced by the Arabs, Persians, Indonesians, Malaysians, Indians, Chinese, Portuguese, and Brits. Even now, the world continues to flock to the island as tourism is Zanzibar’s second and perhaps more important economic driver after agriculture. As with centuries of early spice traders, I was drawn to learn about the flavors of the tropics and to do my part to support a local farm and economy. As with every spice farm, Issa Spice has its own version of Gharam Masala a mixture of cinnamon, clove, ginger, cardamom, cumin, coriander, black pepper, and nutmeg which is used in making African and Indian flavored curries and pilaus (commonly known as pilafs in the States). Every Gharam Masala has its own flavors and intensities, as every spice company puts in varying quantities of each spice. Hence, no Gharam Masala tastes the same. Cinnamon is the first ingredient in Issa Spice‘s concoction and it’s one of the most recognized flavors in the western world. What’s probably not known is that cinnamon is tree bark! Nothing like gnawing on a tree for flavor! Our guide peeled off a piece of bark for us to take pleasure in the sweet cinnamon smell. 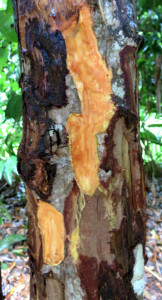 Before it can be used in western cooking, the bark is dried and ground into its common form–cinnamon powder. Cloves are the flower buds of huge trees, towering upwards of 50 feet high, that are harvested, dried and sorted for world markets. Harvesting the flower buds requires the farmer to clamber up the tree to find the blooms. 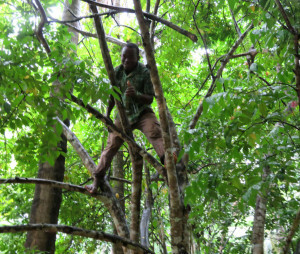 Zanzibar is noted for its premium clove harvest that happens from September to November during their short season rains. Cardamom, a lesser know spice to the American palate, is one of my favorites especially in Christmas cookies and sprinkled on top of broiled grapefruit. Searching for new ground to populate, the main cardamom plant sends out runners on which seed pods are attached. This is similar to the way strawberries send out tendrils to start a new plant. The kernel inside the cardamom seed pod is the spice nugget. Keeping the pod whole until it is ready to be used is recommended as ground cardamom quickly loses its flavor. For peak flavor, it’s best to use ground Gharam Masala quickly, too! Cumin and coriander were not shown on our tour, but are likely cultivated as a field crop. Cumin are the seeds from the flowering plant of the same name, while coriander are the seeds from cilantro, a parsley-like looking plant grown throughout the world and is an essential ingredient in Mexican cooking, too. Pepper, as in black pepper and not green pepper or chilies, grows on a vine in small clusters and once dried are called peppercorns. Peppercorns and ground pepper are found throughout the world as a mainstay spice. The nutmeg fruit is pale green and grows on a tree as tall as a two-story house. Inside the nutmeg fruit, the seed is slightly larger than a gumball and has a red-laced sheathing. The seed is dried and ground to produce the spice we know as nutmeg. All of these wonderful flavors are combined to create the savory, sweet, and exotic flavor of Zanzibarian Gharam Masala. But, what is done with the nutmeg’s red-laced sheathing? It too, is dried and ground into a spice called mace–a peppery nutmeg powdered flavor. The other jungle farm treats were outstanding–turmeric, ginger, jackfruit, starfruit, and other tropical specialties. A young man scrambled high into a starfruit tree to bring down a juicy almost green grape-flavored, mouthwatering sample. Starfruit is a bright yellow six-inch long fruit and when sliced crosswise, each section is shaped like a star. Seeing a ripe jackfruit hanging on its tree is just bizarre. It hangs on to the tree trunk by a thin stem similar to the tubing for the mouthpiece found on a bassoon. The jackfruit has a matte spring-green nubby skin and is about the same size as an old-fashioned oblong shaped watermelon. Our guide clipped the fruit from the tree and opened it for tastings. The bite-sized chunks has just enough sweetness to satisfy and a more mellow flavor than a starfruit. It has the texture of a slightly dry pineapple with a small marble-sized pit inside. Tumeric is eaten as a spice for longevity and ginger is a flavoring that can settle the stomach. Both are both roots. Tumeric stained my fingers and gave me a bright orange tongue, while the ginger just smelled wonderful! 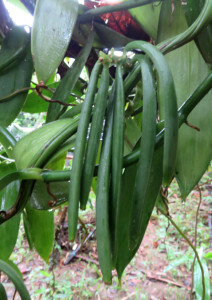 On the other side of the path, vanilla pods, looking like green string beans hanging on the vine were slowly ripening to be ready for picking and processing. Vanilla, a member of the orchid family, is one of the most expensive spices to grow, as each flower must be individually hand pollinated. Even in eastern Mexico, vanilla’s ancestral agricultural home, there is a one percent chance of unassisted pollination success from a specific bee species. Hence the necessity for hand pollination wherever commercially viable vanilla is grown and the costly expense. After our tour, we ate a hearty lunch sitting on the floor of curry and rice–spiced with the flavors of the farm. Since coming home, I’ve cooked with all these spices in sweet and savory dishes. The flavors of the tropics warm the spirits and send me back to Zanzibar–The Spice Island.